Most of the instructions operating on the register file have direct access to all registers, and most of them are single cycle instructions. Each register is also assigned a data memory address, mapping them directly into the first 32 locations of the user data space. Although not being physically implemented as SRAM locations, this memory organization provides great flexibility in access of the registers, as the X-, Y-, and Z-pointer registers can be set to index any register in the file. The registers R26…R31 have some added functions to their general purpose usage. These registers are 16-bit address pointers for indirect addressing of the data space. 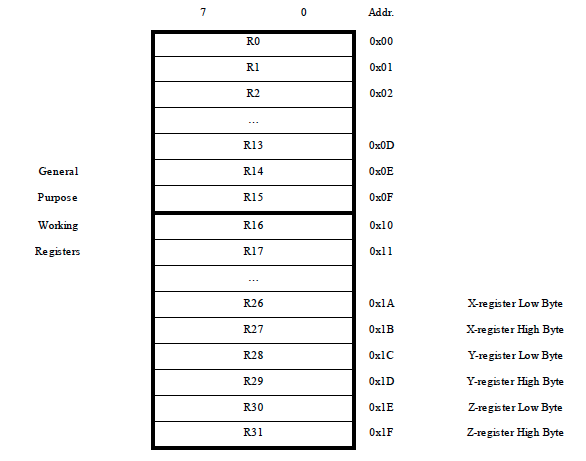 The three indirect address registers X, Y, and Z are defined as described in the figure.